I put the Creamy Bacon Salad Dressing by Walden Farms on my salad which I enjoyed also knowing no cal or carb. 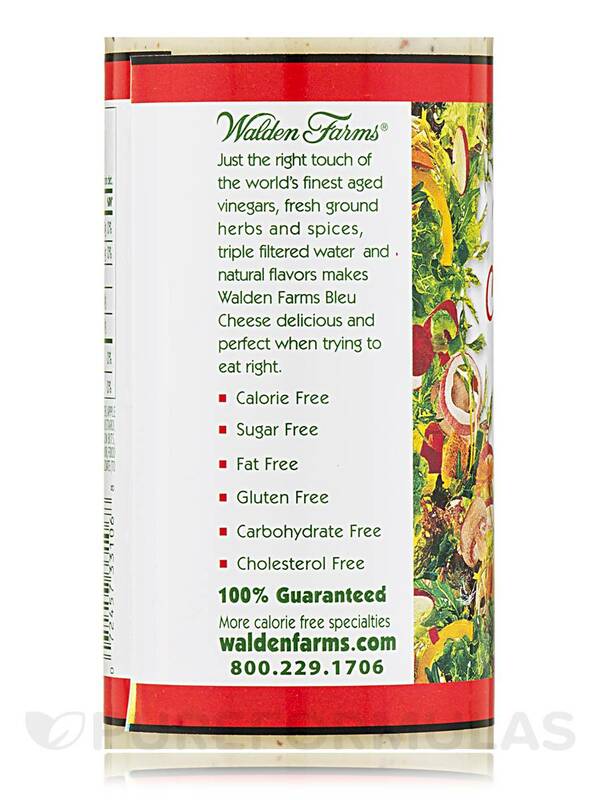 Walden Farms salad dressings are fabulous! To be this tasty with no calories is wonderful. My favorites are Honey Mustard Dijon Creamy Bacon and Ranch. 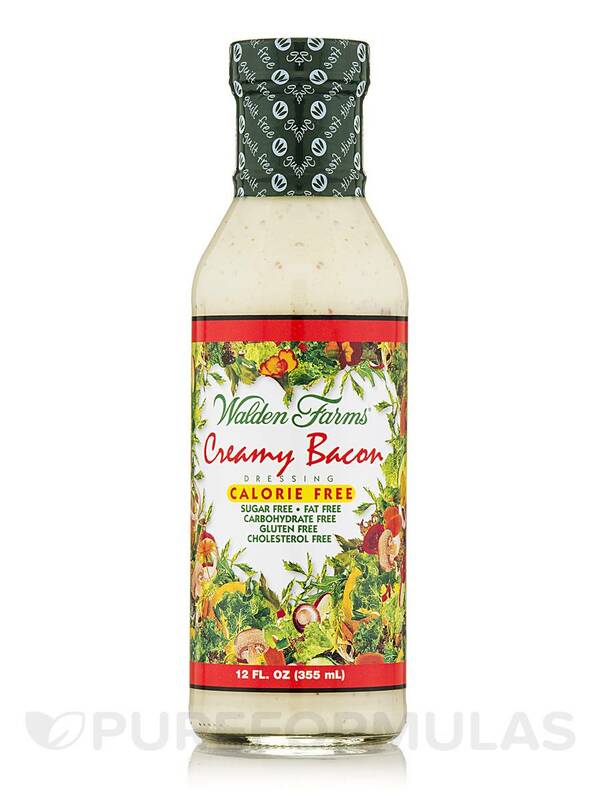 People say ‘everything tastes better with bacon;’ this statement holds true for the Creamy Bacon Salad Dressing from Walden Farms®. In this day and age‚ people are experimenting with food flavors like bacon ice cream and bacon milkshakes‚ so it is not surprising to find a salad dressing flavored with bacon. Creamy dressings are notorious for their high calories‚ but try the ‘Walden Way’ and leave your calorie worries behind. This bacon flavored dressing could be used on salads‚ burgers‚ chicken or even as an accompaniment for wings or spring rolls. It contains apple cider vinegar‚ white vinegar‚ Dijon mustard‚ smoke flavor‚ all-natural herbs and spices‚ and aged vinegars. Losing weight is tough‚ especially when seemingly harmless foods‚ like salad dressings‚ throw you off track. Since this delicious dressing from Walden Farms® is low in calories‚ it could help you stay on the right path and help you achieve your weight loss goals. 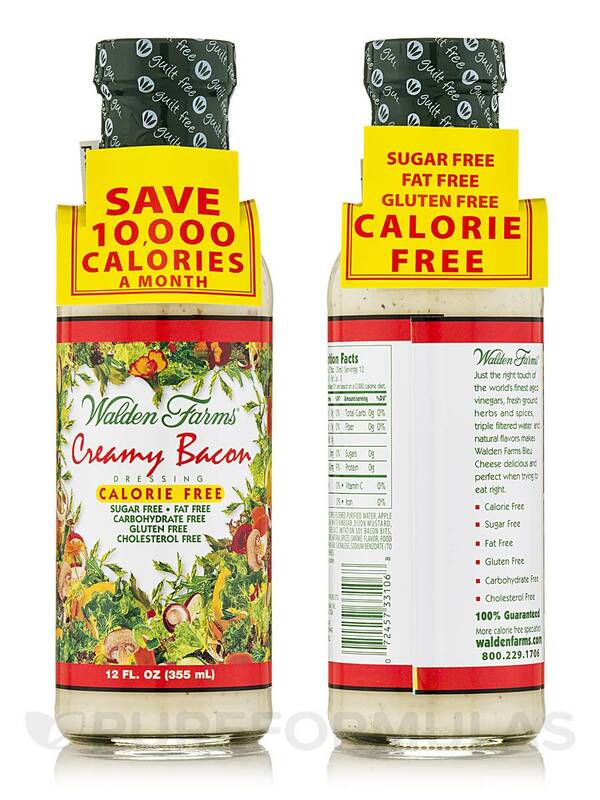 Creamy Bacon Salad Dressing from Walden Farms® does not contain sugars‚ fats‚ carbohydrates‚ and gluten. * Percent Daily Values are based on a 2‚000 calorie diet. Ingredients: Triple filtered purified water‚ apple cider vinegar‚ white vinegar‚ dijon mustard‚ vegetable fiber‚ salt‚ imitation soy bacon bits‚ natural flavors‚ natural spices‚ smoke flavor‚ food color‚ xanthan gum‚ sucralose‚ sodium benzoate (to preserve freshness). I like the taste of Creamy Bacon! 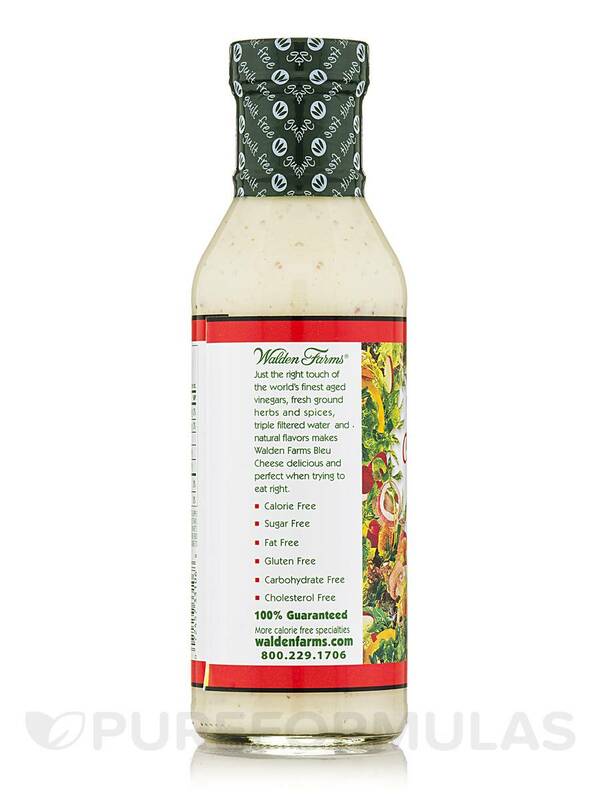 Creamy Bacon Salad Dressing by Walden Farms tastes great! 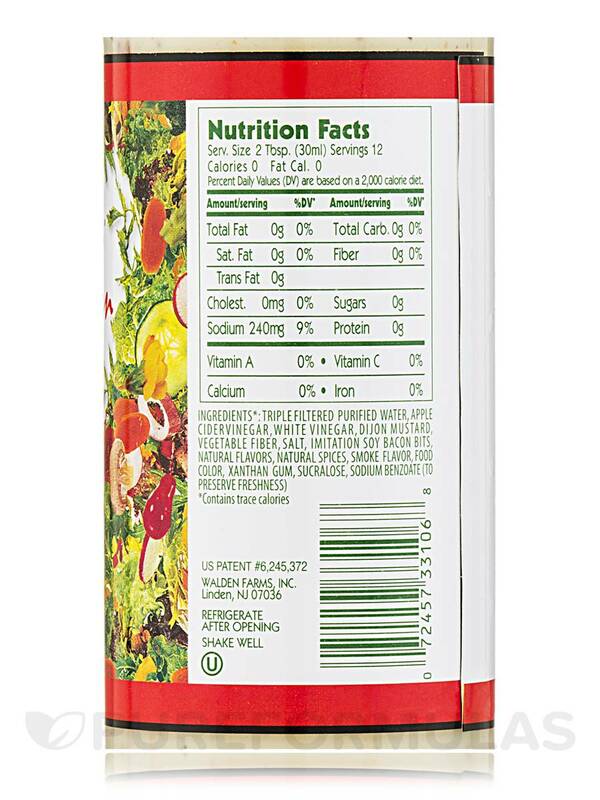 I have to say I usually shy away from zero calorie or zero anything because I know that usually means zero taste but WOW Creamy Bacon Salad Dressing by Walden Farms is good for being zero calorie! My husband is even more picky than me and he's been using this dressing all week. Glad I got 2 bottles! Taste, no calorie, no fat. 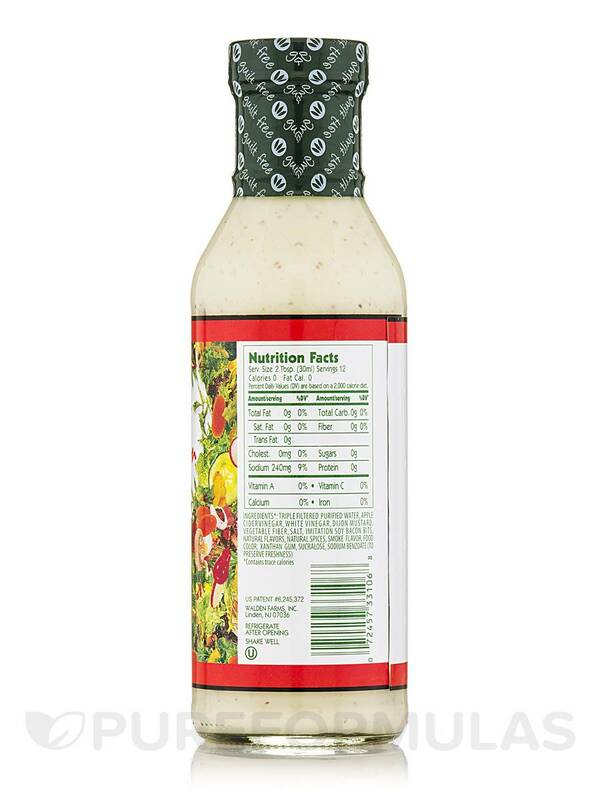 I was actually very surprised at how much flavor Creamy Bacon Salad Dressing by Walden Farms had for 0 Calories...it has more of a hickory smoke flavor to me. If it would be a tad bit thicker it would be 5 stars. I absolutely recommend it though...can't beat 0 calories, 0 Sugars 0 Carbs!! Just a tad bit thin.